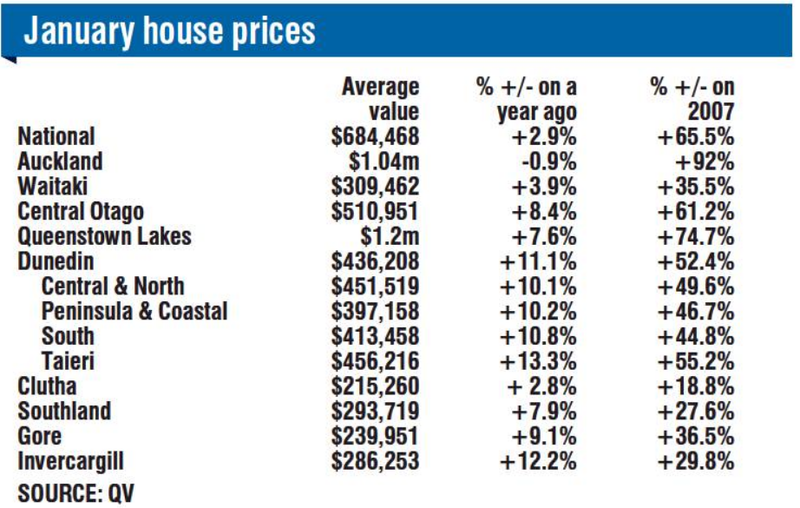 In separate reports yesterday, Quotable Value showed average house values in Dunedin and Queenstown Lakes had risen respectively 11.1% against a year ago, to $436,206 and 7.6% to $1.2million. Massey University's quarterly home affordability report showed Central Otago Lakes, which includes Queenstown, remained the least affordable place in the country - costing more than 14 times the annual wage for that area. Lecturer David White, from Massey University's School of Economics and Finance, said rising median prices were behind the affordability issue. ''Central Otago Lakes is currently 60% less affordable than the rest of the country and median house prices there now cost 14.6 times the annual wage in that region,'' he said when contacted yesterday. Where once interest rates had driven affordability, it was now the gains in average values and median prices, he said. Central Otago Lakes weekly household earnings are $998, in Auckland $1263, Southland $1133 and Otago $1148. Central Otago Lakes has for the past four years been the only one of 12 districts analysed by Mr White where weekly earnings are under $1000. ''There's not a lot of industry or primary sector there, like Auckland and not a lot of high income; they're people in hospitality and tourism,'' he said. Auckland's price-to-income ratio was 12.9 times the annual wage, while Quotable Value said the Auckland region average value was $1.04million, although some suburbs were in a range of $1.1million to $1.5million. Other recent data showed Queenstown was the most popular location for foreign buyers of residential property in 2018, but demand tapered off once the Government effectively banned overseas buyers from existing housing stock in October. Nationally, the QV house price index property values increased steadily during the past year by 2.9%, and by 0.9%, for the three months to January. In Dunedin, residential property values continued to rise and increased 11.1% in the year to January and 2.9% during the past three months. The average value in the city is now $436,208. The Dunedin-Taieri area experienced strong value growth, up 13.3% annually and 4.2% over the past quarter, Quotable Value said. In the South Island, Gore, Southland and Buller led the way in quarterly average value growth, up 4.8%, 4.1% and 3.7% respectively. Invercargill led the way in annual growth, up 12.2%, followed by Gore and Nelson, each at 9.2%. Auckland remains the country's second-least affordable region after a decade of rapid gains, accentuated by a home supply shortage and a construction pipeline that failed to keep pace with the city's population growth. ''After a short reprieve, home affordability has continued to decline in half of New Zealand's regions,'' the Massey report said. ''Recent improvements in incomes and interest rates are helping affordability, but these are still being outstripped by increases in median house prices in many locations,'' BusinessDesk reported.